Ayo Jaiyesimi's ITAN (the Story) staged by THESPIAN Family Theatre & Productions is an intriguing play laced with both cultural and contemporary dance and music that keeps viewers at the 'edge of their seats'! ITAN is based on cross-generational conflicts prevalent in our modern day world. 'Old school, die-hard' village elder Pa Latinwo is shocked to realise that his lost and found 'city roller-coaster' grandson, Dee-Kay, wants no part in his world. Both rooted in their beliefs, battle for supremacy for themselves and their generations. The 'old skool' Latinwo won't stoop to conquer, Dee-Kay won't get 'twisted out of shape'! As the contest begins, TIME (personified as Asiko) catches up with them and takes them on a journey into the past and future. They discover dark secrets that have been shrouded by the veil of time. Will this mediation save the day or tear both worlds further apart? Don't miss this exciting 90- minute story from Thespian Family Theatre & Productions. 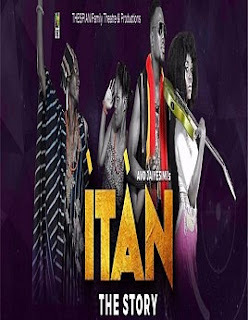 ITAN is directed by veteran Journalist and Theatre Practitioner, Ben Tomoloju.